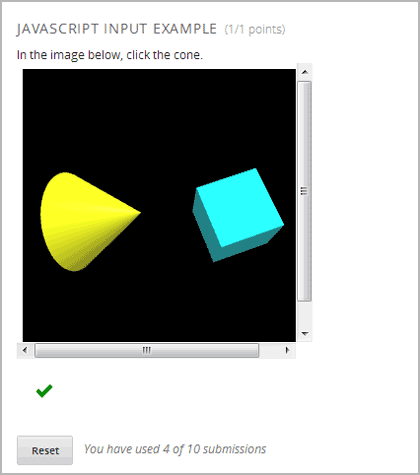 This sample application has learners select two different shapes, a cone and a cube. The correct state is when the cone is selected and the cube is not selected. You can download files for that application. You must upload these files in Studio to use them in a problem. In this example, the state variable is initialized for the cylinder and cube in the WebGLDemo.js file. User interactions toggle the state values of the cylinder and cube between true and false. The getState() function in the sample application returns the state as a JSON string. In this example, when a learner selects Submit, the state variable is saved so that the learner can later return to the application and find it in the same state. In this example, when a learner selects Submit, the getGrade() function returns the selected objects. The returned JSON string is then used by the Python code defined in the problem to determine if correct objects were selected or not, and to return a result. The ans parameter contains the JSON string returned by getGrade(). The value is converted to a Python Unicode structure in the variable par. In the function’s first option, object(s) the learner selected are stored in the answer variable. If the learner selected the cylinder and not the cube, the answer variable contains only cylinder, and the function returns True, which signifies a correct answer. Otherwise, it returns False and the answer is incorrect. In the function’s second option, the objects’ states are retrieved. If the cylinder is selected and not the cube, the function returns True, which signifies a correct answer. Otherwise, it returns False and the answer is incorrect. The XML problem for the sample template is as follows. The shapes below can be selected (yellow) or unselected (cyan). Clicking on them repeatedly will cycle through these two states. be generated after selecting "Submit". Selecting either "Submit"
or "Save" will register the current state.